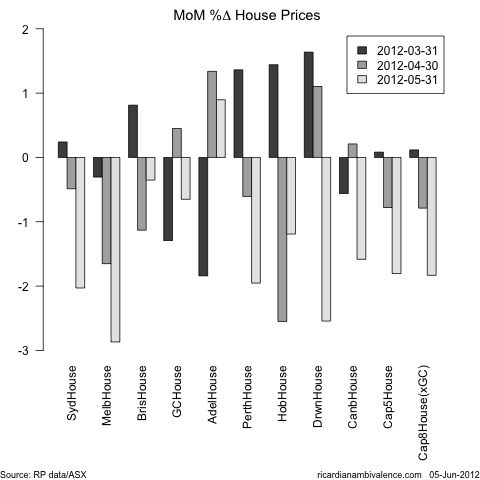 Last week, I linked to Chris Joye’s blog regarding the worrying house price data. Looking more closely at (this excellent) data reveals unexpected and broad based weakness in the housing market (we have both daily and monthly data to end of May). 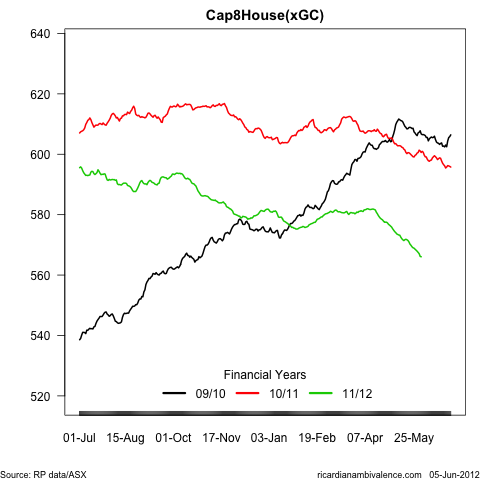 The daily data is highly seasonal, however seasonal adjustment does not improve the picture much. Stripping it so that you can visually separate the typical seasonal noise from the ‘signal’, the ‘downturn’ signal is fairly clear (here i use homes – more on units below). 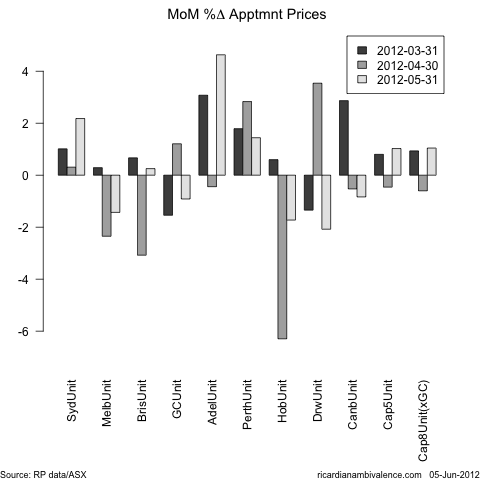 Looking across regions, the weakness in (NSA) house prices is fairly widespread. It looks like something happened in April (Europe’s revenge?) – and it isn’t just seasonal. 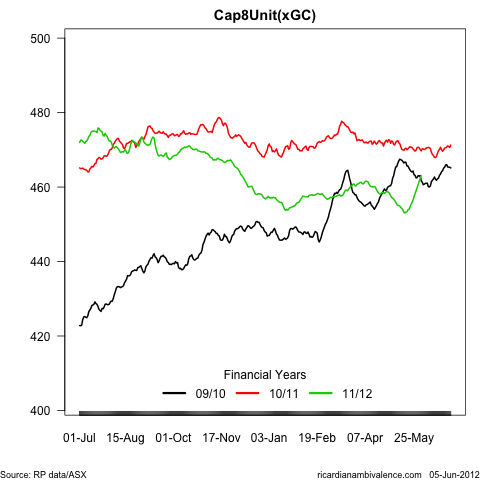 Seasonally adjusting the monthly data does not change the picture much. The decline in Australia-wide house prices in May (the final data point in the above chart) was the largest in the sample. That’s worrying. 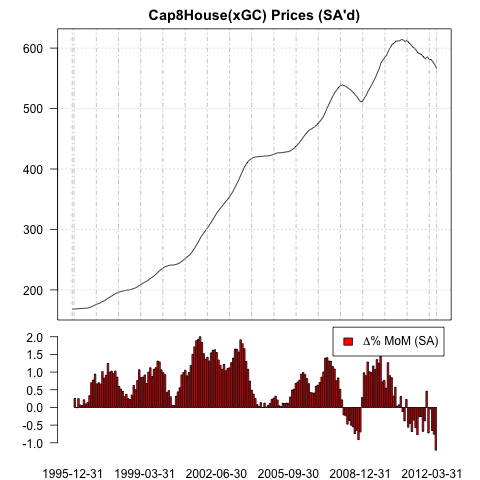 The RBA does not target house prices, however they are a key part of the monetary transmission mechanism, and if house prices keep falling, the negative wealth effect will dominate the positive cash flow effect. In contrast to the housing market, the market for units appears to have responded well to the rate cuts – perhaps this reflects the fact that house prices affordability is worse than apartment affordability, or perhaps it reflects that when folks are less confident about the future, they may prefer a more modest investment in an apartment, rather than a house. What ever the explanation is, it seems clear that unit prices have responded to the 50bps rate cut in May – particularly in Sydney and Adelaide. Seasonally adjusted national ‘unit’ data confirms that this increase is likely to be a real development – and not a seasonal artifact, or noise. As housing is a larger part of the stock than units, on balance, dwelling prices (the combination of the two – shown above) are falling – and the decline in May (the most recent month) is the largest in the data set. Housing used to be the main channel through which monetary policy stimulated the economy – the RBA would cut rates, folks would buy houses, which would push up their prices. The second round effect would be an increase in house building, and an increase in durables consumption (as folks filled their houses with goods). That this is not occurring suggests to me that monetary policy is not particularly stimulatory. Borrowing rates may well be below their long run average, however the housing transmission mechanism is a little blocked. Given this, rates are unlikely to be boosting the broader economy. Good to see your view on housing. Great charts. Can I ask what you use to SA the data? Software and methodology? I use R for all my data stuff and a package called timsac for the time series decomps. There are lots of good options in the R zoo.